If you live in Arizona, then you are sure to have seen a scorpion, and maybe even in your home. Since scorpions enjoy the warm weather in Mesa, Arizona you may have a few questions about the difference between male and female scorpions, and how to keep your family safe. The answer to some of the most common questions regarding scorpion control are found below. Are Male Or Female Scorpions More Dangerous? Both male and female scorpions can sting, but female scorpions are more likely to sting. The reasons for this are many. The female scorpion gets pregnant an average of 4 times each year. This means that she spends the majority of her year pregnant, or caring for her scorplings. This means that her mobility is limited, so she may be more inclined to sting than to flee. How Many Scorpions Can One Female Scorpion Have Each Year? There are over 90 species of scorpions, the most popular in Mesa being the bark scorpion. Female bark scorpions will have 20 or more scorplings each gestation period, which can total over 100 scorpions per female each year. This means that even if you see just one scorpion in your home, you must reach out to a Mesa scorpion removal company as soon as possible. Otherwise, they may multiply much faster than you would like. How Can You Tell A Male Scorpion From A Female Scorpion? It can be tricky to determine whether a scorpion is male or female. Male scorpions are usually thinner and faster than females. Female scorpions carry their scorplings on their back for their first 2 weeks, so if you see babies then it is certainly a female. However, it is not wise to intentionally get close to a live scorpion. Is A Female Scorpion’s Venom More Dangerous Than A Males? The effects of a scorpion sting are the same, regardless of the gender of the scorpion. For the average healthy adult, the venom is not fatal. However, this does not mean that the sting will not go unnoticed. If stung you can expect to experience—immediate pain that soon begins to subside, minor swelling, and minor numbness or tingling around the sting. If these symptoms occur, seek immediate medical attention. Once medical attention is received, identify a Mesa scorpion removal professional to get the scorpions out of your home. 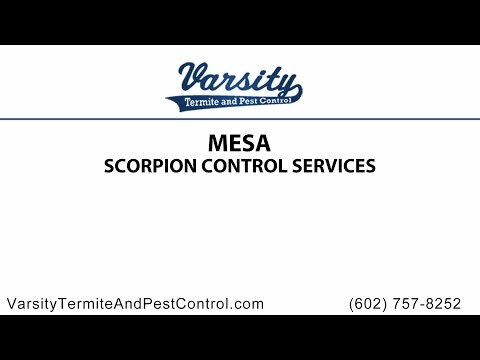 If you are in need of scorpion control in Mesa 85204, reach out to Varsity Termite and Pest Control. Varsity has a signature “Scorpion Barrier” service, designed to repel scorpions—and eliminate any currently living in your home. Contact us today for more information!